Comments: The Nebraska reports are of single birds and are certainly escaped or released birds. Nevertheless, Howell et al (2014) made a case that small groups appearing in fall may be wild birds. The three Nebraska reports are of one at Kearney Lake, Buffalo Co, 24 Feb 1997 that was considered an escapee based on its behavior, including “aggressive begging, following people around, and approaching cars and people fearlessly” (David Rintoul, pers. comm. ), another at Fremont Lakes SRA, Dodge Co 14-16 Feb 2013, and one near Geneva, Fillmore Co 12 Jul 2015. 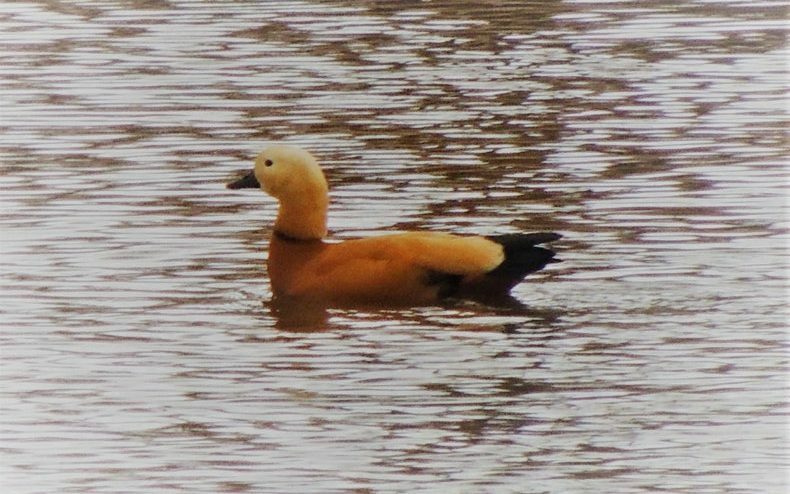 Photograph (top) of a Ruddy Shelduck in Dodge Co 14 February 2014 by Charlotte Croshaw. Howell, S.N.G., I. Lewington, and W. Russell. 2014. Rare birds of North America. Princeton and Oxford: Princeton University Press, New Jersey.